This amazing property was put together by an excellent local design and building team orchestrated by Rick Smith who has created some of the Portland and districts coastal masterpieces in housing design and construction. The house is presented as almost new, being completed just over 12 months ago. We invite inspections to view this magnificent property. Upon entering you will be blown away by the spectacular and elevated views of Portland Bay. This area proves to be the hub of the home with open kitchen, living, dining and expansive double glazed windows allowing natural light and ocean views from all angles. The galley kitchen is stylish, visually stunning and features granite bench tops, glass splash back, custom built cabinetry with self-close drawers and stainless appliances including 900 oven with gas cook top, electric oven and dishwasher. The butler's pantry is a must have in a family home to provide that additional space to prepare and store food and appliances. Extensive glazing ensures the main living area is drenched in light and the views over the ocean are perfectly framed. Containing Sonos surround sound, gas log fire, recessed TV, quality blinds and sweeping views for the family to enjoy. This four Bedroom home offers and adaptable floor plan with the West wing containing three bedrooms all with built in robes and a study or fifth bedroom. There is excellent storage throughout with linen press and powder room as well as the main family bathroom with bath, shower and double vanity. The master bedroom is located in the East wing. A large 4.5 x 3.6mtr room features stunning views, glass sliding doors out to an ocean front deck, large walk in robe, well appointed ensuite with his and hers vanity, shower and a separate toilet. There is a parents retreat / second living zone which is carpeted with built in drawers for storage and a wall mounted TV. Double Stacker doors lead off both sides of the family room, one side to an Ocean front deck, whilst the rear doors open up directly out to the sheltered and substantial outdoor entertaining area. Featuring an 8 seater swim/spa pool, built in four burner BBQ with sink and glass fronted drinks fridge. There is a ceiling fan for regulating air flow, an open fire place and an externally accessed bathroom with shower and toilet for convenience whilst entertaining. An oversize double remote garage with panel-lift doors has internal access and additional space to service as an additional storage area for the home. Separate to this is a 4 Bay solid brick 9 x 11mtr shed with built in kitchenette, shower and toilet. High roof height allows this to be a perfect storage area for boat, caravan ride on mower or those that work from home - the ultimate man's retreat. The dwelling offers solar panels on the roof and is run off 3 x large rain water tanks plus a bore for the garden. With manicured lawns, a low maintenance garden, separately fenced paddocks for small livestock to be ran and ocean views with a rural aspect - properties of this calibre don't come up every day. This home needs to be seen to be appreciated. 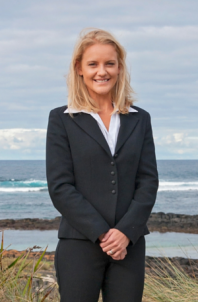 Contact Stockdale and Leggo Port Fairy for further information or to arrange your inspection.